Cooking is a basic skill we must acquire to meet our daily needs. However, some of us pick up this skill faster than others. If you have had some bad cooking experiences, you might even feel intimidated. Don’t worry, you are not alone. In fact, the fear of cooking is such a common problem there is even a name for it: Mageirocophobia. However, cooking is a wonderful skill to have. Your talents can make you healthier, save you money, and allow you to produce wonderful meals for friends and family. Here are five strategies to help you overcome your fear of cooking and take you from zero to hero in the kitchen. Learning is always more effective when it is fun. Think back to the time you were learning to ride a bike. This was probably something you were dying to do, so you made your best effort to pick up that skill as soon as possible. Try to recapture this mindset when approaching cooking. It’s a skill enjoyed by millions the world over, so there must be something fun and fulfilling about it, right? There is on both counts—just give yourself the chance to discover them. OK, you are now ready and willing to learn, but don’t bite off more than you can chew. One of the causes of Mageirocophobia is fear of disappointment and negative judgement. Instead, try starting with some small, single meal experiments on your own. Choose recipes without many pages of instructions, a multitude of steps, and a dozen implements; those are for more seasoned pros. Be sure to set aside time in your day for this cooking training. Also, pick dishes that rely on ingredients easily obtained at your local grocery store. Exhausting yourself trying to find lucuma or Sunrise Red Zero-Tannin Lentils (don’t feel bad if you don’t even know what those are) will just make you frustrated and more tempted to simply order a pizza. Don’t feel depressed when a meal doesn’t turn out well. Even the best chefs produce an occasional dud! You didn’t instantly go from a trike to a hardtail mountain bike, right? Each little success will improve your confidence and sense of adventure. When you’re ready, try recipes requiring a bit more time and attention in the kitchen. Practice and advance planning helps stave off culinary anxiety. Another way to boost confidence is to find a learning partner. This way you can share your knowledge and make note of each other’s mistakes. Also, if you are working with someone who is also trying to master a skill, this usually creates a very supportive environment for both parties. This is not as radical as it sounds! You wouldn’t apply for the position of cook, but you can become more comfortable just by being in an area where food preparation is happening constantly. Try speaking with the chefs and watching how they work. 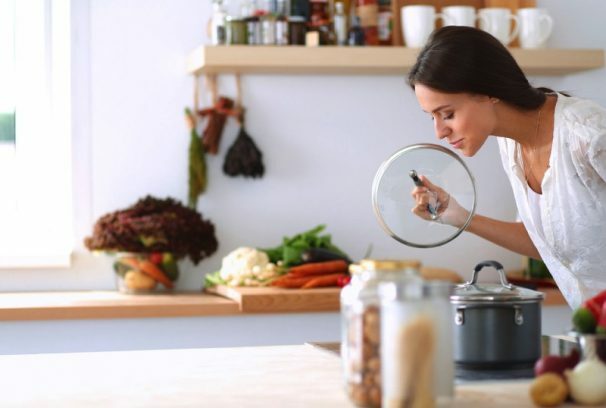 Don’t feel you need to immediately reach their level of expertise, but ask for pointers and shortcuts that will make cooking easier to learn and more fun.